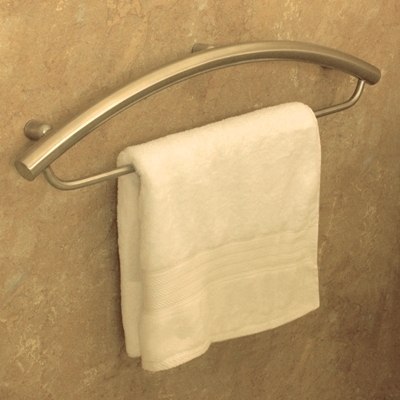 Invisia™ Collection: 16" or 24" Towel Bar & Integrated Support Rail with a 350lbs Weight Capacity. Add a simple yet elegant touch to any bathing area. 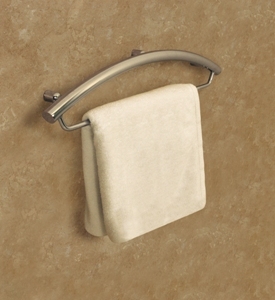 The 16" or 24" towel bar provides ample space to display virtually any towel set. The graceful arc of the integrated support rail creates a functionally superb design element. Central to this contemporary design is an integrated support rail with a 350lbs weight capacity… rest easy knowing that, should you need it, support is always within reach. Its professional grade construction ensures years of reliable service and rock-solid support. Please choose from polished steel or nickel and the size.